In 1991, Russia adopted the so-called "Imperial" flag after terminating the use of the Soviet hammer-and-sickle. The tri-color white, blue, and red flag had not been in use since 1917. The Bolshevik Revolution sought to stomp out any reminders of Imperial Russia. 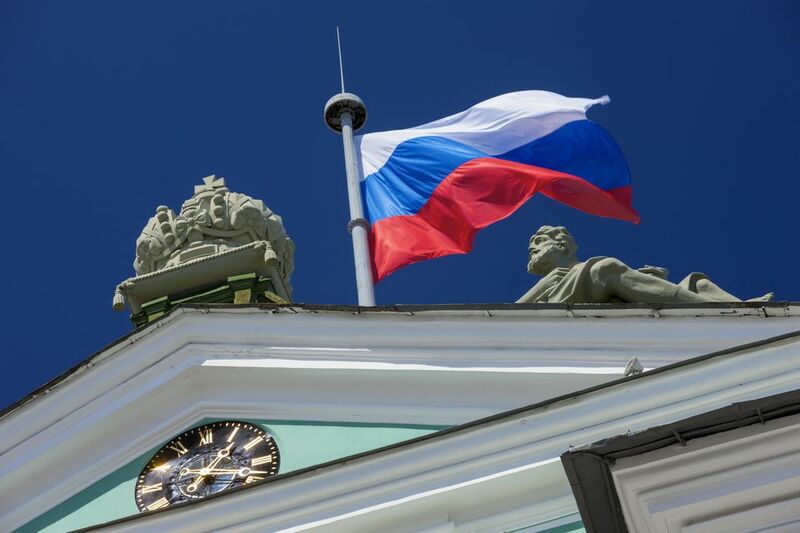 No one really knows what the origins of the Russian flag really are. One legend tells of Peter the Great's inspiration for the Russian flag after he noticed a Dutch flag using the same colors. Peter the Great made so many revolutionary changes to Russia, it wouldn't be surprising if the origins of Russia's flag could be traced back to this seafaring Emperor. Whether or not the story is true, the Russian flag as it exists today has evolved out of the Russian flag designs of the past. It recalls Russia's long line of leaders, its wars, and its shift from communism to democracy. Did you know that Alexander Pushkin is to Russian literature as Shakespeare is to English literature? This analogy has often been used, but Pushkin's influence on Russian culture and literature is actually more extreme than any claim Shakespeare holds over English. You'll see monuments to Pushkin everywhere you go in Russia. You'll also hear him quoted (especially if you speak Russian) and find that seemingly inconsequential places have been made venerable historical sites if Pushkin wrote there, stayed there, or spat there. Pushkin is considered to be the "father of Russian literature" because he chose to write his poems and stories in the language of the common people, that is, not surprisingly, Russian. However, this was revolutionary, considering that anyone who was ​someone (the aristocracy) spoke French in 19th century Russia. Pushkin's work and life are integral to Russian culture. So don't travel to Russia without knowing who Pushkin is! You may recognize his work Eugene Onegin, which was, originally, a novel in verse, but which has since been made into an opera and movies. ​A samovar is a metal container used for heating water and is part of the traditional Russian tea culture. A small amount of concentrated tea is poured from a teapot into a cup. Then hot water is added from the samovar to dilute the tea to the appropriate strength. While samovars have fallen out of everyday use, samovars are still used for some occasions. In addition, antique samovars are sometimes family heirlooms and decorative reminders of the past. You can find samovars at markets in Russia (at Izmaylovo Market in Moscow), but you may have a difficult time getting one out of the country, especially if it is a Russian antique. As a visitor to Russia, you might encounter a samovar in someone's home, at a restaurant, or on the train. A balalaika is a triangular stringed instrument sort of like a guitar. This traditional instrument is sometimes brightly painted with Russian designs and scenes from Russian folk tales. The music of accordions, which are also pictured, feature in Russian folk music as well, along with pipes and other stringed instruments. The balalaika is an instrument that features in the movie version of Doctor Zhivago, so you may have heard this instrument play "Lara's Theme" from the soundtrack. When you're in Russia, you may encounter folk instruments during folk performances or at festivals. You may even be able to pick up a souvenir balalaika of your own at a folk craft shop! The Russian banya (or steam bath or sauna) is still very popular at Russian dachas. Sometimes accompanied by bouts of drinking, sometimes accompanied by birch bark "whisking" (the process of whipping the limbs with birch bark branches to improve circulation), the banya experience is a social one usually followed by the participants jumping into cold water. As with other elements of Russian culture, the banya centers around tradition, the wisdom of generations past, and the practicality of life in Russia. Though individuals don't usually go to the banya in place of taking a shower at home, going to the banya is still considered healthful and a well-established Russian custom. Sometimes banyas are used when the ​hot water is shut off for summertime maintenance in Russian cities. The Russian troika is a sled drawn by three horses harnessed abreast. The troika was a traditional style of cold weather transportation. Passengers would bundle up in furs in the back of the sled to ward off often dangerously low temperatures. The image of a troika often appears in folk art. You may occasionally see Russian troikas such as the one above still used as novelties. The Russian Orthodox cross differs from the Western cross. The top bar represents the plaque that was hung over Christ's head. The middle bar, as in Western Christianity, is the cross beam on which Christ's wrists or palms were nailed. The slanted bottom bar is the footrest - and Christ's feet are represented as being nailed individually rather than together. Other emblems appear on more elaborate Russian Orthodox crosses. Russian Orthodox Christianity is still practiced in Russia, though the religious practice was rare during Soviet times and atheism became popular. 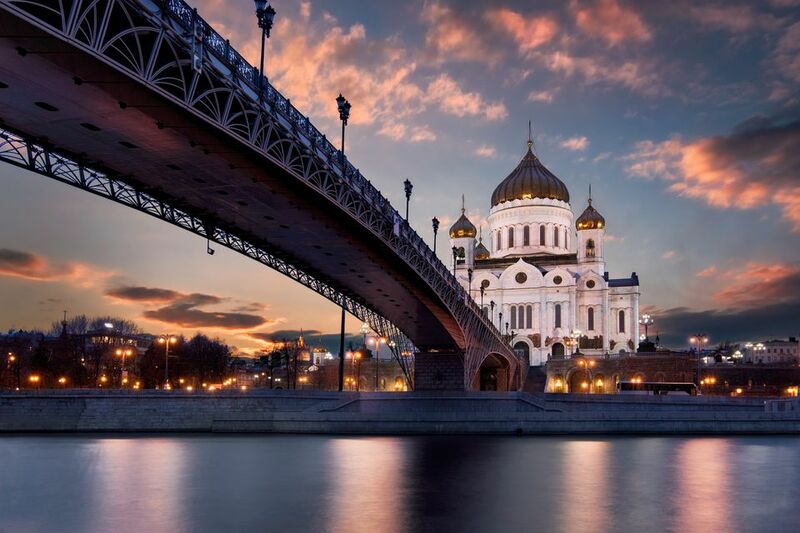 After the fall of Communism, Russian churches and cathedrals were reopened and Russia has seen a renewed interest in Orthodoxy. Originally a Byzantine symbol, the double-headed eagle was adopted by the Russian tsars as their own. One eagle head represents the East and the other represents the West. The horseman in the middle has been described as St. George. The orb and scepter are grasped in the eagle's claws. Above the eagle's heads is the crown. Now the double-headed eagle is on the coat of arms of the Russian Federation. The double-headed eagle you see here is the modern version; the double-headed eagle insignia that was used by the Tsars had some slight differences. When you travel to Russia, you're sure to get a taste of blini, or traditional Russian pancakes. These can be plain, topped with sour cream, or filled with jam, chocolate, or cheese (or just about any other filling you can think of). Caviar is often served on top of crusty, heavily-buttered bread as a part of the zakuska table. You might have some vodka to wash it down. For more information on Russian traditional foods, check out the article by the same name. Or find out more about Maslenitsa, Russian Pancake Week. If you want to try a little Russian cooking on your own, there are Russian cookbooks available. Russian nesting dolls, or Matryoshka Dolls, make popular souvenirs. They often depict women in Russian traditional dress. Valenki are traditional Russian felt boots worn to keep feet warm during the winter. Valenki make great souvenirs from Russia or practical purchases for winter travel.